Please see the videos of some new and exciting things that we are doing in our lab!! Interests: Genetics of regeneration in the context of whole organisms, using the zebrafish as an animal model. Genomics approach on FAC sorted cells to establish the genetic networks implicated. Post-natal mammals in general and humans in particular, have limited potential to regenerate whole organs with a few exceptions (like the liver) or specific tissues with a few more exceptions (like the skin and the gut’s lining). By contrast, various lower vertebrates maintain important regenerative power throughout their adult lives. They can not only recreate whole organs, but also regenerate most tissues even highly specialized ones, like neuroepithelia. For example it has been shown that adult fish display powerful regeneration of the tail and the heart when amputated. Upon damage, they are also capable of restoring functionality in highly specialized tissues, like sensory epithelia of the inner ear. However, our understanding of regeneration is primarily descriptive and only a few genes involved have been identified so far. Because of gene conservation between species, regenerating lower vertebrates offer potent models in which one can dissect the mechanisms of regeneration and its underlying genetics. In that prospect, zebrafish is offering a number of valuable tools. Its rapidly developing transparent embryos allow high resolution imaging when combined to transgenic lines expressing fluorescent markers in a tissue/cell-specific manner. In addition, the potential to generate mutants, which allows dissecting the genetics of any chosen mechanism, makes it an excellent animal model to study regeneration. Two day post fertilization (dpf) live embryos in their protective chorion (black arrows). 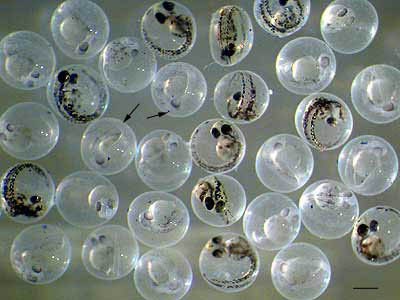 Some of the embryos start to get pigmented but they will stay mostly transparent for several more days (–:400 microns). My lab focuses more particularly on regeneration of sensory neuroepithelia. In the inner ear, the hair cells are mechanoreceptors which respond to sound waves (in the cochlea) and to head movements (in the vestibule). Those mechanical signals deflect bundles of cilia on the apical surface of the hair cells, which transduce them into electric signals sent to the CNS via the VIII cranial nerve. In mammals in general and in humans in particular, hair cells don’t regenerate, while ototoxic drugs (including antibiotics and cisplatin), loud noises or mechanical shocks can damage these structures irreversibly. Various genetic diseases affect the number of hair cells or their function. The absence or loss of hair cells is the single leading cause for hearing loss worldwide and those cells are of major interest to the field of biology of hearing. Progress has been hampered because of the difficulty of access of the inner ear, which is deeply buried inside the skull. The paucity of epithelia available in each animal is another major hurdle. Hair cells in a sensory epithelium of the inner ear in a live 5dpf transgenic zebrafish larva. A cytoplasmic membrane bound green fluorescent protein (mGFP) is specifically expressed in the hair cells. Their long cilia (white arrows) and cell bodies (white *) are visible (–: 5microns). Widely used mammalian models are incapable of regenerating hair cells, rendering them of little use when trying to understand regeneration. In fish, the regenerative power is observed in the inner ear, but also in an evolutionary and physiologically related organ, the lateral line. It is formed by a stereotypical distribution of superficial sensory patches, called neuromasts. They are composed of two main cell types, namely the hair cells and the accessory cells. 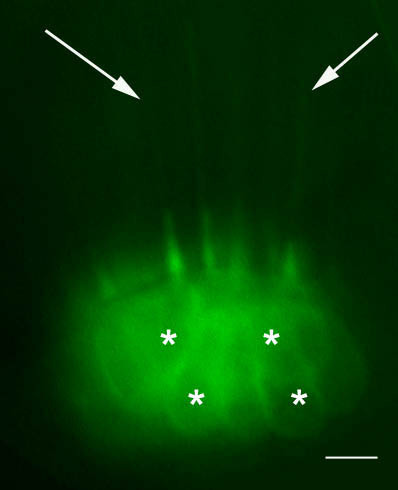 Live embryo (3dpf) expressing GFP in the neuromasts (white arrows) which are forming the lateral line located superficially in the fish. The red lines delimit the inner ear (–: 100 microns). This relatively simple organ is divided in well delimited small functional sensory units, but it is also located “skin deep”. This makes it easy to access, manipulate and observe in the context of a living animal. 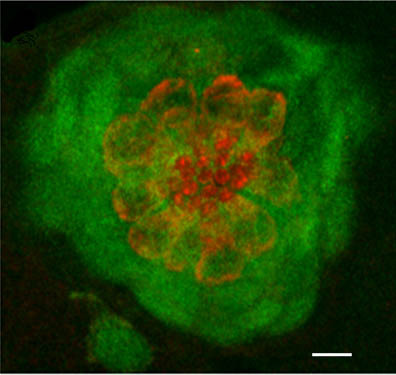 Hair cells can be destroyed using several lines of approach, while leaving the rest of the larva intact, therefore triggering regeneration in toto and in vivo. Using real time imaging one can observe regeneration in its physiologic context, following this dynamic phenomenon, while it is happening in the whole animal. Hair cells in a lateral view of a neuromast in 5dpf transgenic zebrafish larva (the same as in Fig.2). GFP is expressed in the hair cells of the lateral line too. Like in the inner ear, long cilia (white arrow) and cell bodies (white *) of the hair cells are visible. The bundled cilia are protruding through openings in the skin into the water and inform the larva about surrounding water movements (–: 5microns). Upon destruction of all the hair cells, it takes about 3 days for a neuromast to regenerate. It will be fully reconstructed to its previous size and the function will be restored in all of its new hair cells. It is known that a subset of the accessory cells comprises the pool of progenitors which will enter division and differentiation to replace the missing mechanoreceptors. However, little is known about the multiple steps necessary to complete the entire 3-day process. How are the dying/dead hair cells cleaned out? How are the different accessory cells rearranged and reorganized? How and which cells are entering division? Are all divisions equal (symmetric, asymmetric…)? How is the progenitor pool maintained? How is functionality restored (innervation, vascularization…) in the nascent hair cell? How are cohesion and size of the whole structure preserved and controlled? Confocal image in a 5dpf zebrafish larva. 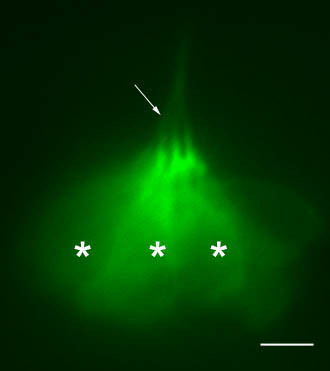 GFP (in green) is specifically expressed in the accessory cells of the neuromast (dorsal view). A subset of those cells completely engulf and isolate (from each other) the centrally located hair cells, which are counter-stained with an antibody against myosin VI (red) (–: 5microns). Capitalizing on the genetic power of zebrafish, our short-term objectives are to elucidate the molecular events underlying the multi-step process of regeneration of hair cells in the lateral line in zebrafish larvae. As an entry point, we are using a zebrafish mutant line (phoenix), which we have previously characterized. The mutated gene is novel and homozygote larvae have a clear reduction in regenerated hair cells in the lateral line. We have shown that although the progenitor cells are present in pho/pho, they are not entering division upon destruction of the hair cells. We are currently pursuing several approaches to elucidate the function of this new gene, including work in fish and human cell lines. Movie 1The progenitor cells are part of the accessory cells which are expressing GFP (green) in the wild type transgenic neuromast. Between 18 and 24 hours post ablation (hpa) of hair cells, an average of 12 cells are BrdU positive (red). This demonstrates that these cells have entered the cell cycle and incorporated BrdU in the neo-synthesized DNA. 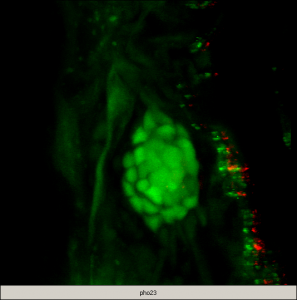 Movie 2The progenitor cells/accessory cells are present and expressing GFP (green) in the pho/pho mutant transgenic neuromast. 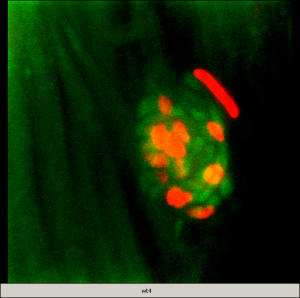 However, between 18 and 24 hpa of hair cells, no GFP positive cells are BrdU positive (red), meaning that these cells have not progressed to the S phase of the cell cycle. In addition, we have established (in wild type and phoenix mutant backgrounds) double and triple stable transgenic lines which are co-expressing GFP and RFP in a subset of cells of the neuromast in the lateral line. These fish lines will be imaged with in vivo state of the art imaging technology, coupled to a genomic approach. We are separating GFP positive cells from transgenic larvae to interrogate their transcriptome by micro-arrays. Ultimately, we will integrate the gene expression profiles with the live imaging done at the cellular level in whole animals. This approach will generate an integrative understanding of the dynamics of regeneration of a sensory epithelium at the molecular and cellular levels in the context of a whole organism. Ultimately it will allow designing restorative procedures to trigger regeneration in sensory tissues in humans. Building on the knowledge gathered in the lateral line, the long term goals of my lab are to extrapolate and compare those findings to the regeneration of other tissues and organs in order to underpin the commonalities and differences and provide a comprehensive understanding of regenerative processes. This body of work should eventually lead to powerful means of uncovering novel routes to healing numerous ailments plaguing humankind. Colón-Cruz L, Kristofco L, Crooke-Rosado J, Acevedo A, Torrado A, Brooks BW, Sosa MA, Behra M. Alterations of larval photo-dependent swimming responses (PDR): New endpoints for rapid and diagnostic screening of aquatic contamination. Ecotoxicol Environ Saf. 2018 Jan;147:670-680. doi: 10.1016/j.ecoenv.2017.09.018. Epub 2017 Sep 19. BA Torres-Hernández, LR Colón, C Rosa-Falero, A Torrado, N Miscalichi, JG Ortíz , L González-Sepúlveda, N Pérez-Ríos, E Suárez-Pérez, JN Bradsher, M Behra. Reversal of pentylenetetrazole-altered swimming and neural activity-regulated gene expression in zebrafish larvae by valproic acid and valerian extract. Psychopharmacology (Berl). 2016 May 11. [Epub ahead of print] PubMed PMID: 27165438. LA Kristofco, LR Colón, SP Haddad, M Behra, CK Chambliss, BW Brooks. Age matters: Developmental stage of Danio rerio larvae influences photomotor response thresholds to diazinion or diphenhydramine. Aquat Toxicol. 2016 Jan; 170: 344-54. doi: 10.1016/j.aquatox. M González-Solá, HA Al-Khayat, M Behra, RW Kensler. Zebrafish Cardiac Muscle Thick Filaments: Isolation Technique and Three-dimensional Structure. Biophys J. Apr 15; 106(8):1671-80, 2014. H Xu, D Ye, K Mesch, X Tan, Z Sun, SM Burgess, M Behra, S Chen, F Lin. Gβ1 controls collective cell migration by regulating the protrusive activity of leader cells in the posterior lateral line primordium. Dev. Biol. Jan 15;385 (2):316-27, 2014. VE Gallardo, M Behra. Fluorescent Activated Cell Sorting (FACS) Combined with Gene Expression Microarrays for Transcription Enrichment Profiling of Zebrafish Lateral Line Cells. Methods. Aug 15;62 (3):226-31, 2013. M Behra, VE Gallardo, J Bradsher, A Torrado,A Elkahloun , J Idol, J Sheehy, S Zonies, L Xu, KM Shaw, C Satou , S Higashijima, BM Weinstein, SM Burgess. Transcriptional signature of accessory cells in the lateral line, using the Tnk1bp1: EGFP transgenic zebrafish line. BMC Dev Biol. Jan 24; 12(6), 2012. VE Gallardo, J Liang, M Behra, Elkahloun A, EJ Villablanca, V Russo, ML Allende & SM Burgess. Molecular dissection of the migrating posterior lateral line primordium during early development in zebrafish. BMC Dev Biol. Dec 13;10: 120, 2010. M Behra, J Bradsher, R Sougrat, VE Gallardo, ML Allende & SM Burgess. Phoenix is required for mechanosensory hair cell regeneration in the zebrafish lateral line. PLoS Genetics. Apr 5 (4):e1000455, 2009. TA Hawkins, AP Haramis, C Etard, C Podromou, CK Vaughan, R Ashworth, S Ray, M. Behra, N Holder, WS Talbot, LH Pearl, U Strähle & SW Wilson. The ATPase dependent chaperoning activity of Hsp90a regulates thick filament formation and integration during skeletal muscle myofibrilogenesis. Development. Feb: 135, 1147-56, 2008. C Etard, M Behra, N Fischer, D Hutcheson, R Geisler & U Strähle. The UCS factor Steif/Unc45b interacts with the heat shock protein Hsp90a during myofibrilogenesis. Dev. Dyn. 308(1):133-43, 2007. ZM Ahmed, R Goodyear, S Riazuddin , A Lagziel, PK Legan, M Behra, SM Burgess, KS Lilley, ER Wilcox, S Riazuddin, AJ Griffith, GI Frolenkov, IA Belyantseva, GP Richardson & TB Friedman. The tip-link antigen, a protein associated with the transduction complex of sensory hair cells, is protocadherin-15. J. Neurosci. 26 (26): 7022-34, 2006. C Etard, M Behra, N Fischer, S Jesuthasan, P Blader, R Geisler & U Strähle. Mutation in the delta-subunit of the nAChR suppresses the muscle defects caused by lack of Dystrophin. Dev.Dyn. 234 (4):1016-25, 2005. M Behra, C Etard, X Cousin & U Straehle. Using zebrafish mutants to identify secondary target effects of drugs. Toxicol. Sci. 77 (2): 325-33, 2004. M Behra, C Bertrand, X Cousin, J Vonesch, A Chatonnet & U Strähle: Acetylcholinesterase is required for neuronal and muscular development. Nature Neurosci. 5 (2): 111-118, 2002. F Bolanos Jimenez, A Bordais, M Behra, U Straehle, J Sahel & A Rendon. Molecular cloning and characterization of Dystrophin and Dp71, two products of the Duchene Muscular Dystrophy gene in Zebrafish. Gene. 274 (1-2): 239- 41, 2001. F Bolanos Jimenez, A Bordais, M Behra, U Strähle, J Sahel & A Rendon. Dystrophin and Dp71, two products of the DMD gene, show a different pattern of expression during embryonic development in Zebrafish. Mech. Dev.102 (1-2): 239-41, 2001.